McDermott has been awarded an engineering, procurement, construction, installation and commissioning (EPCIC) contract from BP Trinidad & Tobago for the Angelin gas field, located off the east coast of Trinidad and Tobago. 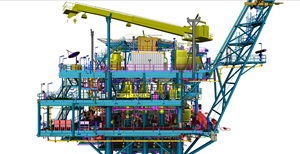 McDermott will provide a turnkey EPCIC solution to design, procure, fabricate, transport, install and commission a six-slot wellhead platform and 26-inch (66 cm) subsea pipeline. The 900-tonne four-legged main pile jacket and 1,200-tonne four-deck topside will be constructed at the Altamira, Mexico fabrication facility.